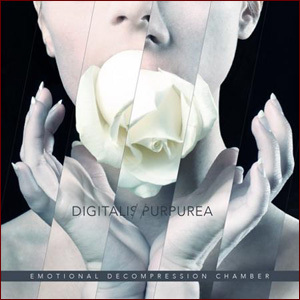 Digitalis Purpurea is an Electro-Industrial project creating idiosyncratic music since 2000 from Turin, Italy. Digitalis Purpurea is the botanic name of the Purple Foxglove, a plant symbol of temptation, pleasant but at the same time destructive. Traditionally the foxglove was used as medical plant but had also an obscure use, an overdose in fact is lethal. That’s why it was called “devil’s finger”. Particularly Pi Greco chose the name referring to a poem by Giovanni Pascoli “Digitale Purpurea”, where he compares Maria, the blonde innocent to Rachele the brunette with “burning eyes”. This is also the inspiration for one of their first songs “Elena & Maria”. The first demo tape “Pi Greco Squad” has been produced in a very limited number of copies and it has been recorded in winter 2003 at CryptoStudio with a vintage analogic 8-tracks recorder that provides a rough, rotten and rusty sound to the songs. A new approach that mix together modern electronic beats and old school black metal style making the band a new talent of the Italian industrial scene. Some songs included in the first release has been re-proposed in 2004 with the self-produced EP “19 celebrations in 19 mutilations” that helped to solidify Digitalis‟ international fanbase through their web-presences. In 2005 they recorded the cover of „Ideomatic‟ as a tribute to the space rock band Rockets, selected to take part to the second volume of the “IBM compilation” a manifesto of the EBM-Electro-Industrial made in Italy. In March 2007 has been released the split-cd “Gears of Industry” together with the band No Forgiveness to promote the exclusive live show “Turin Industrial Massacre” and in May 12 they have been selected to support “Das Ich” with a unique show in collaboration of the fetish burlesque performers “Diamond Dolls”. After two years of gigs and recording sessions in 2008 Digitalis Purpurea signed a worldwide contract with Aural Music/Dreamcell11 to publish the full-length album titled “Aseptic White”. 9 new tracks sound engineered by Victor Love (Dope stars Inc) where their violent sound mixed with a more hit-oriented production make this record a new dancefloor smasher. The tracklist include two special bonus tracks: “Ideomatic” featuring Celine Cecilia Angel from the Austrian project Sanguis et Cinis and “Maneater” the pop song by Nelly Furtado, a new slap to the even more stereotyped industrial music scene. Now the band is back with the brand new concept album “Emotional Decompression Chamber”.